In 2009, Jason Giambi had concluded a seven year contract with New York that paid him about $120 million. Jason was one of baseball’s self-admitted steroid users. He was also a terrible defensive first baseman. The Yankees made it to only a single World Series during his seven years with the team, after having played in five during the previous six years. So there’s no way you can feel sorry for this guy, right? Wrong, at least according to my lovely wife and passionate Yankee fan, Rosemary. In June of 2005, Rosie’s birthday present to me was two tickets to a Yankee game against the Pirates. At the time, the Yankees had been playing .500 ball and Giambi was contributing next to nothing. 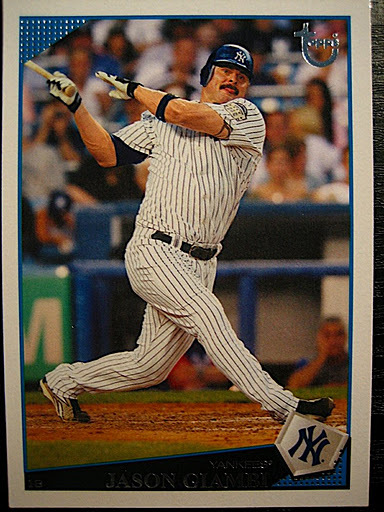 Yankee fans remember that 2004 had been the year they found a tumor on Giambi’s pituitary gland, ending what had already become the worst season of the slugger’s career. During the 2004 post season, reports of Giambi’s admitted steroid use became public and he then issued his famous “sort of an apology”. So when Rosie and I took our seats in the first row of Yankee Stadium’s right field upper deck, Giambi was lost at the plate and New York skipper, Joe Torre, was actually batting him eighth in that day’s lineup. What surprised me a whole lot more was the volume and fierceness of the jeers from the fans that met Giambi when his name was announced before his first at-bat in the bottom of the second inning. That’s when my wife stood up and began screaming “Let’s Go Giambi, you can do it.” When she sat down I asked her when she had become such a huge Giambi fan and she told me she felt sorry for him. On that day, Giambi became her new favorite Yankee. Jason proceeded to smash a hard line drive single to right field. In his next three at bats he did not reach base and struck out twice but the Yankees did rally from a four run deficit to force the game into extra innings. In the bottom of the tenth, Giambi came up with the winning run on second and with Rosemary standing on her feet and screaming at the top of her lungs, smashed a Jose Mesa fast ball into the right field upper deck for a game-winning two-run home run. Remarkably, Giambi proceeded to go on a tear at the plate. When that day’s game against the Pirates started, Giambi’s batting average was .238 and he had a total of 4 home runs and 17 RBI’s for the season. By the end of that season Giambi had hit 32 home runs, driven in 87 and raised his average to .271. The Yankee record from the day of that game was 63-35 and they captured the 2005 divisional title. This former Yankee teammate of Giambi also celebrates a birthday on January 8th as does this former Yankee reliever.